The north polar ice cap of Mars is called Planum Boreum. It has a diameter of about 1,000 km (600 mi). Four distinct units, stacked together make up the polar cap, which sits nearly centered on the pole at 90° north. At thickest, the entire ice cap stack rises about 3,000 meters (10,000 feet) above the northern plains. The plains, however, lie about –5,000 meters (–16,500 feet), below the average radius of Mars, which scientists use as sea level. The four units are, from bottom to top, the basal unit, the polar layered deposits, the residual ice cap, and the seasonal ice cap. The bulk of the ice cap lies in the polar layered deposits, which make up about 2,000 m (6,600 ft) of the cap's thickness. The basal unit on the bottom of the ice cap is poorly explored because it is mostly hidden under the layers above. Portions however are exposed on the floor of Chasma Boreale. This is a large canyon about 100 km (60 mi) wide that cuts into the ice cap for 570 km (350 mi). At maximum near the center of the ice cap, the basal unit has a thickness of nearly 1,000 m (3,300 ft). The basal unit is made of sand and dust cemented by water ice. Scientists think the upper (younger) part formed during periods when polar ice was deposited, then sand sheets covered the polar deposits. The timescale for these layers remains unknown, but scientists estimate the basal unit is at least a billion years old. Also, they think it formed under different climate conditions than Mars has today. 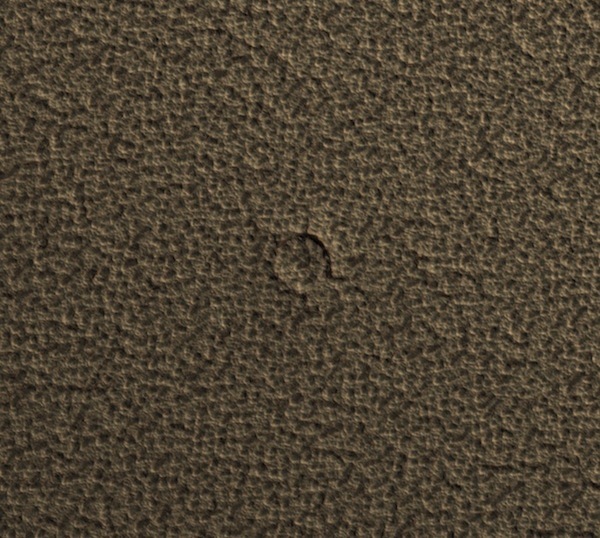 Sand from the basal unit has come loose, and blown by the wind, it has made large dune fields, such as Olympia Undae. These dunes are loosely connected into a sand sea that encircles the north polar cap. At least some dunes appear currently moving. Above the basal unit lie the polar layered deposits, with a maximum thickness of about 2,000 m (6,600 ft). These deposits make up most of the ice cap. Made of mixed layers of atmospheric dust and water ice, these offer scientists their best hopes for untangling Martian climate history. 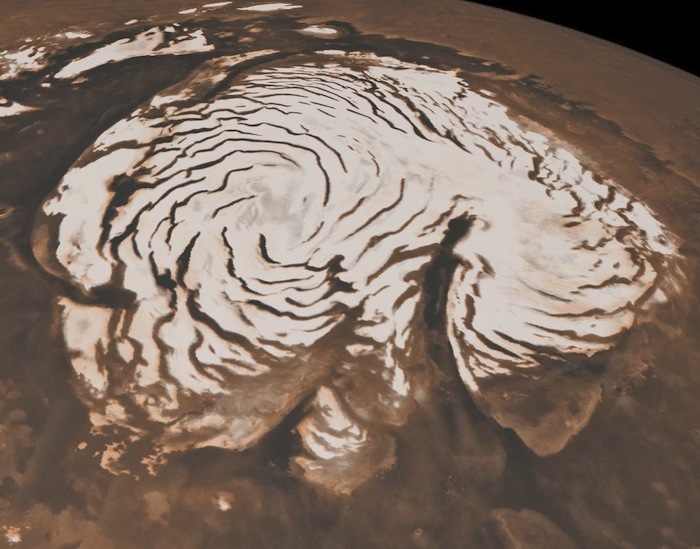 Studies using the MARSIS radar on Mars Express show the layers are almost entirely water ice with only 2 percent dust at most. As imaged by the HiRISE camera, the thinnest layers are decimeters (about a foot) thick. Many appear rough, some are wavy, and others show places where layers pinch together. Scientists estimate that the ice in the layers has flowed, distorting them, similar to what happens in terrestrial glaciers and ice caps. The layers stand exposed mainly in the walls of the canyons that slice into the polar cap. The largest of these is Chasma Boreale, while smaller ones are visible on all sides of the ice cap. Scientists have two hypotheses/theories to explain the origin of the canyons. One says that solar heating causes water ice at the ice cap edges to sublimate. This "heat erosion" starts to spiral into the body of the ice cap. The canyons then are widened by strong winds — as much as 400 kilometers (250 miles) per hour — blowing down off the ice cap. The second hypothesis/theory suggests that the canyons show where ice has flowed out from centers of ice accumulation within the cap. In this theory, the pattern occurs because the ice flows at uneven speeds and in different directions. Scientists suspect both processes have shaped the ice cap. How much time each layer represents surely varies from layer to layer, but is an open question. Estimates range from about 9,000 years to more than 8 million years. However, most research favors an age of roughly 120,000 years, based on cyclic changes in the Martian orbit. The exposed layer edges show tantalizingly repetitive patterns that suggest both short-term variations in climate and longer ones. These are likely caused, scientists think, by changes in the planet's axial tilt and its orbit that repeat or nearly do so. Rolling these variations together, scientists can calculate climates for only the last 10 or 20 million years. After that, errors become too large. A major focus for Martian climate research, therefore, is to try to connect visible layering in both sets of polar layered deposits with the calculated orbital changes. Imaged by HiRISE, its surface has pits about 10 to 20 meters (33 to 66 ft) wide and a meter or less deep. Scientists think the layer itself has the same thickness — roughly a meter or a bit more. At the current time, at least, this water-ice cap appears to be in a steady state. It is neither gaining nor losing much each Martian year. Finally, at the top of the polar stack lies the seasonal ice cap of CO2 ice. This forms and disappears every Martian year. Like the residual cap, it is only about a meter or two thick, but each winter it covers the residual cap and blankets Mars from the pole down to about 60° north latitude.